GENEVA (28 February 2012) – “The Government of Bangladesh must ensure that any policy concerning open-pit coal mining includes robust safeguards to protect human rights. In the interim, the Phulbari coal mine should not be allowed to proceed because of the massive disruptions it is expected to cause,” said today a group of United Nations independent experts. They warned that if this open-pit mine is permitted, it could displace hundreds of thousands of people and lead to the violation of fundamental human rights. 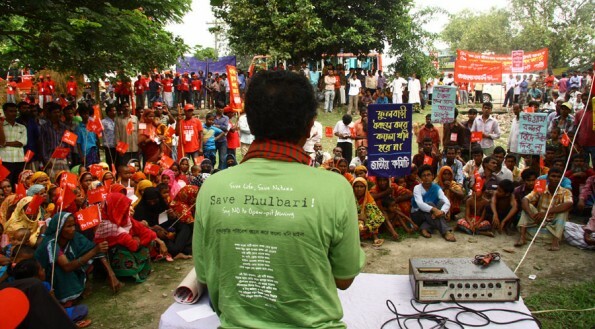 “The Phulbari development would displace vulnerable farming communities, and threaten the livelihoods of thousands more by doing irreversible damage to water sources and ecosystems in the region,” the experts said, noting that an estimated 50,000 to 130,000 people would be immediately displaced by the project, with up to 220,000 potentially affected over time as irrigation channels and wells dry up. Food and water “Nearly half the Bangladeshi population is food insecure, and nearly one quarter severely food insecure. Local food production should be strengthened, not sacrificed for industrial projects,” said the Special Rapporteur on the right to food, Olivier De Schutter. The land under threat is located in Bangladesh’s most fertile agricultural region where production of staple crops such as rice and wheat allows subsistence farmers to feed their families, and supports the entire country’s food needs. Displacement and indigenous rights Those likely to be affected include entire villages of Santal, Munda, Mahili and Pahan indigenous peoples. “Displacement on this scale, particularly of indigenous peoples, is unacceptable without the indigenous peoples’ free, prior and informed consent, and poses an immediate threat to safety and standards of living,” warned the Special Rapporteurs Raquel Rolnik (adequate housing) and James Anaya (indigenous peoples).